SAT We offer the best SAT preparation in Saudi Arabia. Online Study Center Access 6 months of access to our SAT Online Center which includes extensive study materials and resources, online workshops and video tutorials allowing you to review lessons and strategies at any time. Teacher Support Still have questions? Don't worry! You'll have full teacher support even after the class finishes via email. SAT Course Books Your course comes with a complete set of Kaplan SAT Study Materials, including Kaplan's SAT Course Book and Study Sheet. The SAT Channel New and exclusive to Kaplan, the SAT Channel offers live streaming prep from the best instructors. Combined with our In Person course, you'll receive the most hours of interactive prep available. 8 Full-length Practice Tests Access 8 realistic timed practice tests, 4 of which are official College Board SAT practice exams. If you want the best preparation for the SAT, you’ve come to the right place. 95% of Kaplan students got into one or more of their top college choices. Strengths and weaknesses—we all have them, but yours will differ from other students' and they'll change as you progress through your SAT preparation. That's why we've designed our SAT courses to provide ongoing, personalised learning based on your specific needs. We do this through a revolutionary, adaptive learning technology that we call Smart Reports. 2. 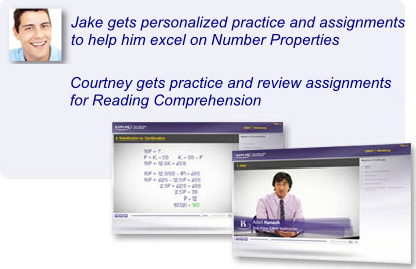 Smart Reports then evaluates each student's practice test and provides a comprehensive performance analysis. 3. The system then recommends assignments to help students master the specific content on which they need improvement. 4. Smart Reports targets the highest-yield areas for each student, providing the greatest point gain possible on the SAT. All students need to meet minimum English proficiency requirements in order to benefit from this course. For non-native speakers of English: this course is designed for students who have scored 477/153 or above on the TOEFL (or equivalent test).